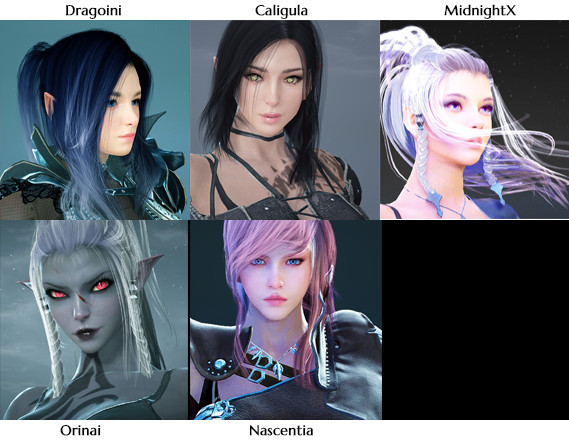 Dark Knight Pre-Registration Beauty Contest Winners! Today we are proud to announce the winners of the Dark Knight Pre-Registration Beauty Contest! For those that did not catch all the event details you can find them >Here< The top 5 most downloaded authors from each region (NA and EU) are as follows. For the second portion of this event players needed to create a Dark Knight character between the following dates, Feb. 22nd till Mar. 1st 2017. To all of you who participated we appreciate your enthusiasm and look forward to seeing more awesome characters! those are some awesome creations, I must say! Thank goodness that the person with the most download in NA and their default Dark Knight template didn't win. Situation was the same on EU too, and the 2nd most voted being a Harley Quinn template from korea. 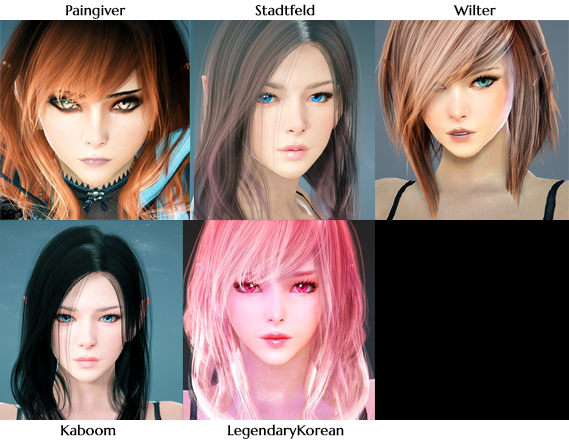 Half of theses are the default faces with neon hair. great respect to all this people, they look all amazing! I guess I couldnt win two outfits since that would have left two of my templates in the top 5 well darn, Im happy with one though considering when I created my character customization I had no idea there was a contest in the first place, I found that out later after creating 3 customization's first. Lol the EU designs are so much better than NA. Good, at least that the #1 didnt win. #1 as in the person who just clicked create and save in under 5 seconds. Orinai Dark Knight looks like a Dark Elf from the EverQuest series. I like it. Congrats to all winners. But didn't have those who created their Dark Knight early in the event advantage against those who created their DK later? I want the dark elf from EU on NA so I can use it. I have uploaded her to NA for you! Too bad the one that was in second place admitted that theirs was a template from KR... as was 3rd place. I honestly think events like this should be reworked. Like, templates from other regions should be locked to those regions only and can't be used and entered. I have to say, the 4 that have the most "originality" look in no particular order are Paingiver, LegendaryKorean and Wilter from NA and MidnightX and Orinari from EU. New to the game, but love those looks a lot, look forward to creating my look to be as beautiful as what I see here. Thank you for hosting the event, BDO, and thank you to the creators for designing such magnificent characters. Definitely makes me want this download to finish faster!!!! Legendarykorean, Midnight, and Orinai deserve an extra reward. They really went above and beyond in this one. This so much. Im glad to see Oris and Nascs win, instead of the stolen and basic templates with no effort at all. Still it is not really their fault, if people chose the first uploaded templates. Of all the winners, yours is the only good one. The rest are just plain.